The combination of free range organic fried chicken, crispy maple bacon and roasted corn placed this over a regular chicken cobb salad. The use of butter lettuce was an interesting variation. Smoked Salmon and Avocado Toast - The King Salmon was smoked, flavorful and very tender. It was combined with vegan hollandaise, avocado, pickled red onion, poached organic cage-free eggs. 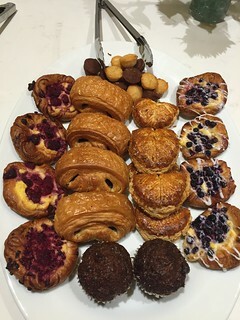 The flavors were bold and worked very well together. The chicken was both crispy, tasty and moist inside. 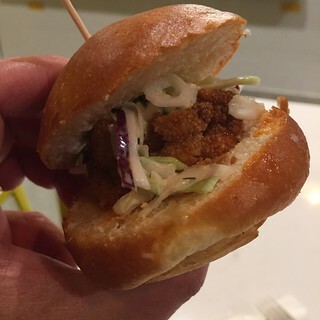 The honey sriracha remoulade and radish cabbage slaw inside the sandwich complemented the fried chicken nicely. 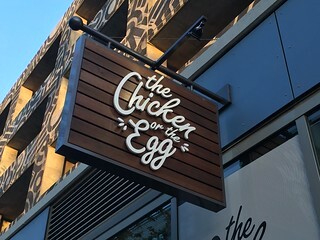 Chicken or the Egg will conduct a soft opening in mid September. Check their website for the latest information.